Hello everyone, today I complete my Fashion Spring Alert with Stripes. Stripes have been around in fashion for quite some time. Back in 1858, the french navy implemented a blue - white striped shirt (Breton shirt) as a uniform for all seamen in Brittany. After a vacation in Brittany, Coco Chanel incorporated the stripe design into her nautical collection from 1917. Since then the Breton shirt was worn by many celebrities. In the 1990s, Jean Paul Gaultier took on the Breton style and made it his trademark. Most recently in 2011, Miuccia Prada showed the fashion world that stripes can be stylish in other ways than just nautical style. Below I put together a selection of different stripe - styles. I really love that this trend is not limited to garments only, but rather expands to accessories and shoes. Therefore, it is a really versatile trend, which you can integrate into your wardrobe in many different ways. 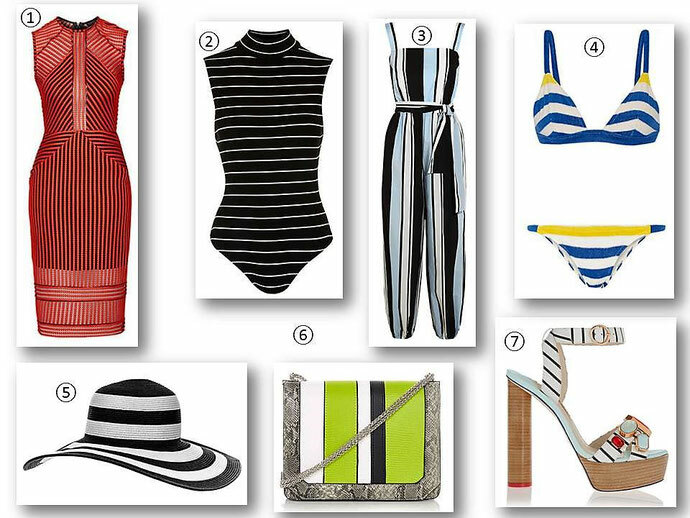 I hope my style board gave you a little inspiration of how to rock the stripe trend. Which of the three trends is your favourite? Please comment below.